Taste test: These nuclear orange-colored tortilla chips looked had a flavor powdering more red and less orange than the usual Nacho Cheese Doritos. They were as crunchy as you would expect from Doritos, so I got to enjoy a good crunch before the flavor kicked in. 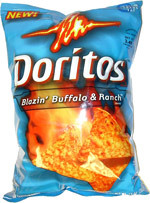 They sort of tasted like buffalo wings and ranch dressing, assuming you let "buffalo wing" and "ranch" be defined by the flavor-masters at Frito-Lay, which means that the ranch tastes more like the Cool Ranch Doritos, and the buffalo wings taste more like Spicy Nacho Doritos. The chips did have a heat kick, but nothing so drastic where you'd be running for a glass of water after eating a chip. I was hoping for more of a ranch dressing taste to cool down the mouth, and didn't really get one. 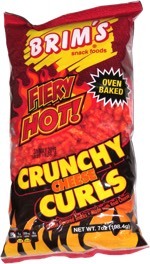 I still prefer the Black Pepper Jack Doritos over these. Smell test: Smells like every other bag of Doritos I've ever opened.